It’s a matter of common knowledge that with time the Magento 'core_url_rewrite' table continuously increases in size, which in turn affects website’s performance and reduces processing efficiency of data bases. We’ve figure out the source of the problem and developed a sublime solution for you. The reason for increasing size of the foregoing table is duplicating/intersecting URL Keys of products and categories. To be more specific, default Magento renames duplicated URLs into 'product-1.html', 'product-2.html', and so on, by adding a respective sequence number. As if that wasn't enough, in case of multi-category products, a number of the records is multiplied by a number of the related categories. How about geometric series here? With every reindex or product/category edit, this happens infinitely. Just think of it for a moment: the table gets continuously pumped, a reindex operation takes forever to finish, and records increase by almost half. 3) There is something to be accentuated: the extension is not a one-time pill for your system. 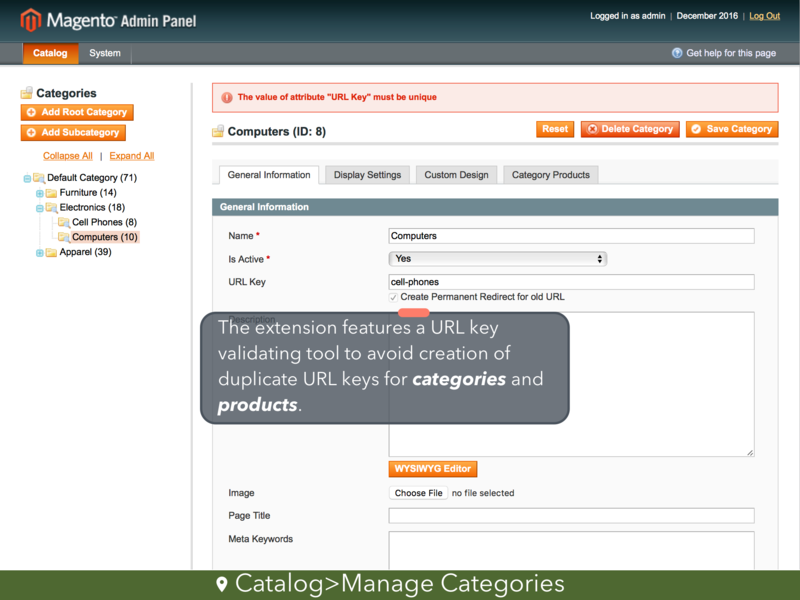 It automatically fixes several Magento bugs during Catalog URL Rewrites reindex or while saving product/category. So the table won’t be increasing in size without real necessity. 4) A handy 'Unique URL Key Verification' setting can be enabled to prevent admin user to enter duplicated URL keys. 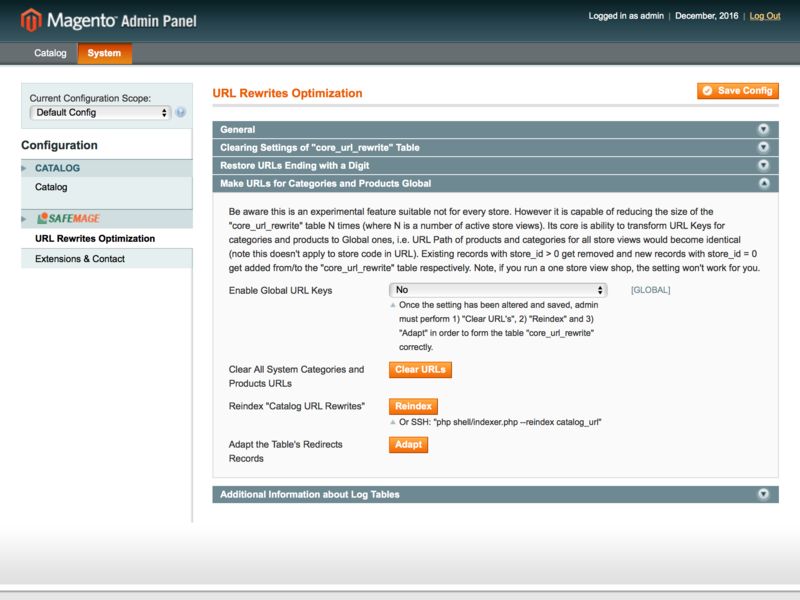 5) To get even more out of the optimization, you can exclude categories in product URLs. After disabling the setting below, the Catalog URL Rewrites must be reindexed. Real examples? Once upon a time, we managed to lower the number of table records from 27 million to mere 45 thousand (this is terrific 600 times less). The table has remained on the similar size level until now. It is capable of reducing the size of the "core_url_rewrite" table N times (where N is a number of active store views). Be aware this is an experimental feature suitable not for every store. Its core is ability to transform URL Keys for categories and products to Global ones, i.e. URL Path of products and categories for all store views would become identical (note this doesn't apply to store code in URL). Existing records with store_id > 0 get removed and new records with store_id = 0 get added from/to the "core_url_rewrite" table respectively. Note, if you run a one store view shop, the setting won't work for you. 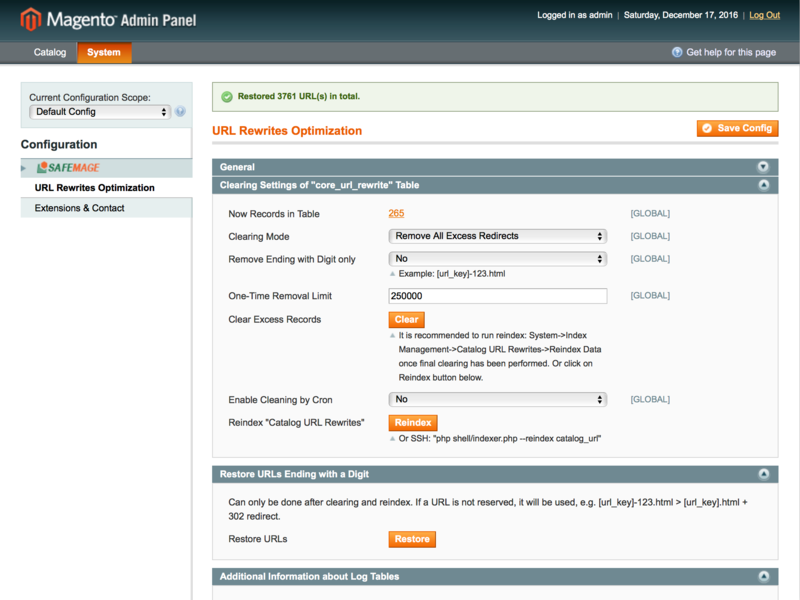 Please share your results of the 'core_url_rewrite' table optimization using our product, i.e. records: before > now. We provide comprehensive product support for all the Magento extensions available on this site starting from the moment of your purchasing them. If you need help on the extensions installation or on any issues relating to our products, our dedicated team of proven technical experts is at your service, ready to assist you at any time. Limited 'Unique URL Key Verification' to products only. Enable Routing of Products with Category Path in URL. Added a new 'Routing of Pages Ending with a Digit' setting. Improved optimization results when the ‘Use Categories Path for Product URLs’ setting is set to ‘No’. 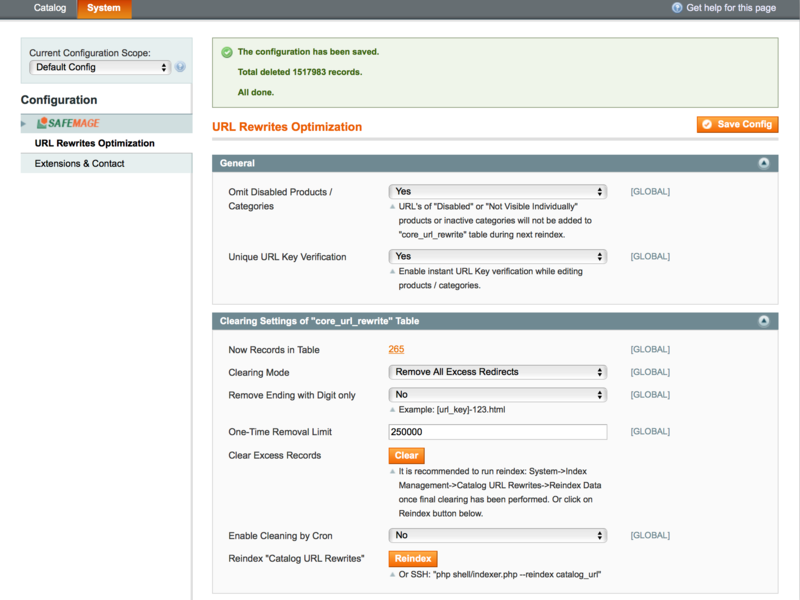 Added compatibility with Mageworx SEO Suite. Addressed an issue with rewrites for disabled categories. Added Global URL feature (experimental). Addressed minor compatibility issue with Magento CE 1.6.x. Added ability to omit disabled stores. Added Restore and Reindex buttons. Added automatic clearing by Cron. Added new clearing mode 'Remove only with Digit at End'. Get this extension or you will suffer from some weird URL rewrite bugs Magento has had for quite some time. We found out by clicking the product links in some of our social posts that lead to 404 not found pages, especially those with duplicate URL keys. Lost so many potential social buyers from Pinterest and Facebook. This is a no-brainer for all Magneto stores, get it by all means! 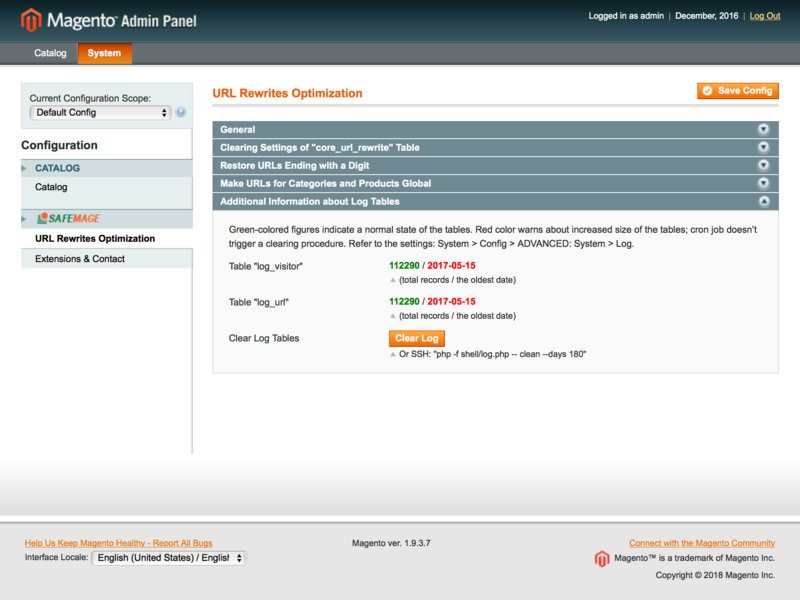 Your extension rewrites optimization is the bomb, fixes a very big problem in magento, thanks alot! 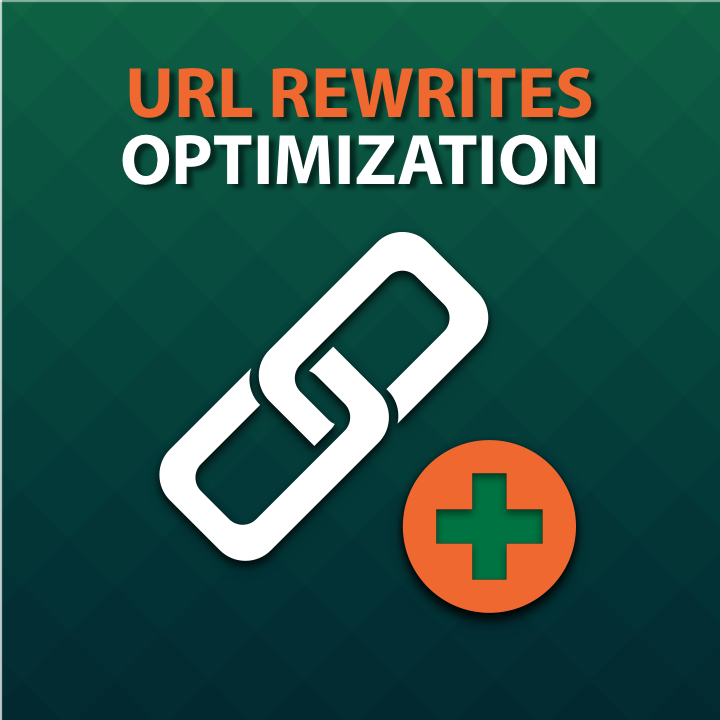 This is a very good extension, with a little help the extension reduced the amount of rewrite url's from 2 milion to 80K! With nice 301 rewrites from digit urls to non-digit urls. Cleared about 15 million records! I got 22 thousand products in the store, mostly configurable (3500) and simple (18500, not visible individually) ones. In several years, the table with URLs has grown greatly and began affecting page load time. Once I installed the extension and ran it, the table shrank down to 5 thousand records. Unbelievable! The URL’s of the products not visible individually are not being added to the "core_url_rewrite" table anymore. In fact, it’s an odd thing to add such URL’s to the table. I also played around the settings Visibility and Status to make sure a record is added when a product is Enabled and Visible, and the former is removed when the latter isn’t enabled. The module works like charm, even without additional re-index. Respect! SafeMage is glad to welcome you on our website! Here you will find complex eCommerce solutions! Using our extensions and services you are getting an excellent solution for your own business needs. Any kind of your feedback is highly appreciated. Don't hesitate to contact us if you have any questions or suggestions regarding our products or help is needed with the modules installation. Magento trademark, registered Magento® logo are the property of Magento, Inc. Copyright © 2016 SafeMage.com. All Rights Reserved.